I would like to divide my application in modules. For instance, there would be a "core" modules that contains the basic login functionality, app layout/formatting (CSS etc), user management and a diary. Later on I may create other modules like a contact manager that can easily be added or removed from the application. There would be some logic in the apps navigation for determining which modules are present and to show/hide the links to them. 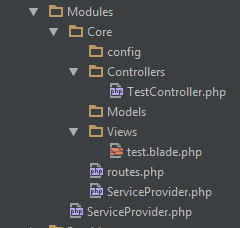 How can I do this in terms of directory structure, namespaces and anything else that's needed? I am looking at creolab/laravel-modules but it states that it is for Laravel 4. Can I still use it with 5 in exactly the same way? The documentation says to place models, controllers and views within each module directory, but how does this work with routes? 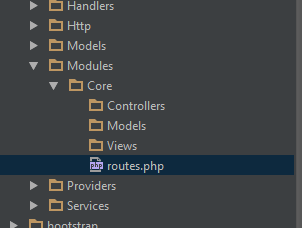 Ideally I would like each module to have its own routes.php file. How will all of this work with the stuff in the http and the resources directory? But I have no idea how I would get it to work. With no extra libraries etc, just pure Laravel 5. What is causing this and how can I fix it? I have one last question, how would I load all my controllers from inside my package, much like how the loadViewsFrom() method works? I seem to have figured it all out. I'll post it here in case it helps other beginners, it was just about getting the namespaces right. I imagine when I come to doing my models for the package it will be a similar case of getting the namespaces right. * i.e. with their routes, views etc. Note : You can add your module name whichever you have created. Here there are modules. You can just install and check the process. Note: I am not advertising. Just checked that cms built on Laravel with module support. So thought that might be helpful for you and others. Kundan roy: I liked your solution but I copied your code from StackOverflow, I had to change the quotes and semi-quotes to get it working - I think SOF replace these. Also changed Dir for base_path() to be more inline with Laravel's (new) format. pingpong/modules is a laravel package which created to manage your large laravel app using modules. Module is like a laravel package for easy structure, it have some views, controllers or models. It's working in both Laravel 4 and Laravel 5. And then run composer install to fetch the package. Not the answer you're looking for? Browse other questions tagged php laravel laravel-routing laravel-5 or ask your own question. How to link assets which are inside of module in Laravel? Can I use Laravel 5 Middleware to allow packages to override app routes? How to route to a controller method in Laravel Moduler development?